We are excited to launch Project Register, a nonpartisan initiative created by Congressman Jim Cooper and State Senator Steve Dickerson to increase voter registration where Middle Tennesseans work, live, learn and play. In 2015, the duo worked together to boost Nashville high school voter registration by 85%. Project Register expands that effort to businesses, nonprofits, neighborhoods, universities, and entertainment venues. Why do we need Project Register? Tennessee has one of the lowest voter participation rates in America. Although Middle Tennessee’s population is growing, civic participation is not. We rank 50th in voter turnout and 40th in voter registration. More than 838,000 Tennesseans are not registered to vote, and 60% are under the age of 45. Together, we can improve voter registration in Middle Tennessee. In 2016, the Tennessee legislature unanimously approved online voter registration. The Secretary of State unveiled the new online tool in September 2017, but many people are not aware of this user-friendly website. Now more than ever, it is easy to perform our civic duty. To have your company participate in Project Register or for more information, call our office at 615-736-5295. Voting in Tennessee can be tough if you’re a recent high school graduate or college student. 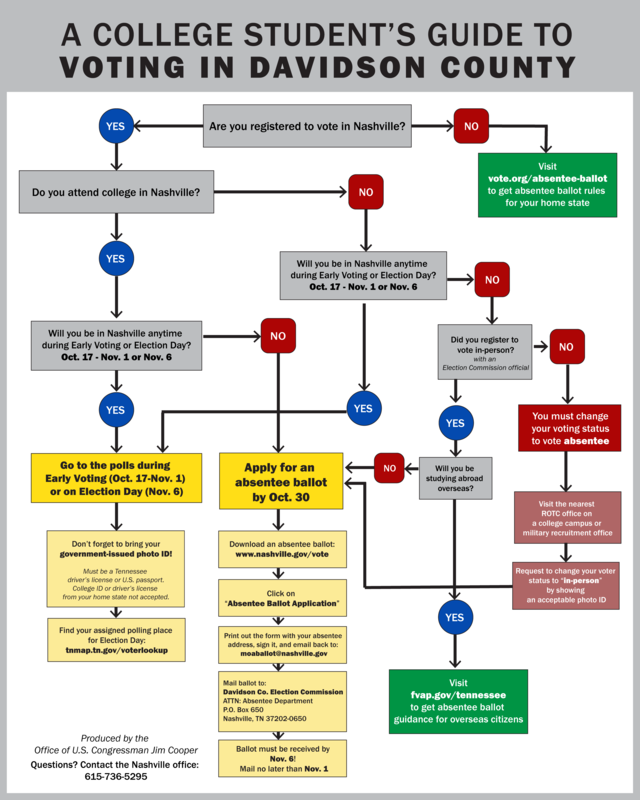 We hope this guide can help young voters in Davidson County navigate the process. If you run into a scenario we haven’t considered, let us know! Are you registered to vote in Nashville? 2. Do you attend College in Nashville? Don’t forget to bring your government-issued photo ID: Must be a Tennessee driver’s license or U.S. passport. College ID or driver’s license from your home state not accepted. Did you register to vote in-person with an Election Commission official? 5. Will you be studying abroad overseas?